The usual methods of manufacture were followed, with careful attention paid to the relative size of each section of the bows. Water buffalo horn from East Asia was used for the bellies of bows and sinew from moose legs for the backing. The glue was a combination of fish bladder glue and tendon glue. Hardwoods and yew were used for the cores.2 Only three bows were seasoned for more than one and a half year, the others were tested about 8 months after the final application of sinew. It is possible the performance may still improve for these bows. According to Turkish sources,3,4 flight bows have the shape of the crescent (hilal kuram), while war and target bows the shape of a boat (tekne kuram). This descriptions apply to shapes of unstrung bows and there are photographs of existing bows to illustrate the shapes.4 The crescent-shaped flight bows had the transition between the kasan and sal sections5 less reflexed than the boat-shaped war bows. On the other hand, the sal sections were more recurved past the grips than in the tekne kuram bows. The illustrations show a target bow almost identical to the crescent shape, with the exception of longer sal sections, which makes the bow look somewhat closer to the tekne shape. These conventions were followed in making the bows for the tests (see photographs). The heaviest bow was a hybrid between a target and a war bow. This bow was tested twice: once at 27.5in (125.5lb) and then at 29 7/8in(136lb). The length of the bows was measured along the curvature of limbs. Tips beyond the nocks were not included in the measurements. Draw lengths for the bows were selected based on published data4,6,7,9 and on lengths of arrows in museum collections.9 The range is from 20in for a short version of target arrows up to 29in for war arrows (the measurements do not include arrowheads)4. The 24.5in flight arrows were drawn to about 28in within the Turkish overdraw device (siper). Longer draw lengths could be accommodated to give better performance, but were not tested. For comparisons with other bows, it is important to realize that a longer draw length not only raises the draw weight, but also increases the efficiency and arrow velocity, even if tested at the same draw weight. An increase of at least 5fps (feet per second) per inch of draw can be expected. Dacron strings were used for all bows. This material, although capable of more extension under stress than a natural cellulose fibre such as flax, hemp or ramie, was considered a better imitation of the more elastic silk, a common material for bowstrings. An inextensible (high modulus) and lighter string material increases efficiency of bows12. One of the bows was tested with a modern string made of Spectra-type fibre (Fast Flight) for a comparison with modern bows. Unfortunately, only several shots could be taken with it, as the bows could not survive the shock caused by the string. Usually, the string nocks began to break, even if reinforced with horn. Nevertheless, it was found the efficiency increased by over 6% with the Fast Flight strings, about the same as in the case of modern bows.11 The efficiency with cellulose fibre strings would probably be also a little higher. The testing was done with a shooting machine, designed to release an arrow at the instant a desired draw length was reached. This method imitates real shooting with traditional bows and helps to avoid the let-down caused by creep of materials (hysteresis). The total time of draw and release was up to 2 seconds. It was found the arrow velocities would drop when the bows were held at full draw for a few seconds. This could potentially cause a significant scatter of the velocity readings. However, once the release was performed within 2 seconds as tested, the readings for the same arrow differed less than 1 fps thorough all tests. Average of three shots with each arrow are shown. In case of the heaviest bows, some of the lightest arrows shattered during tests, limiting the number of shots to one or two. The results were still considered valid, as all grouped well on the regression curves. 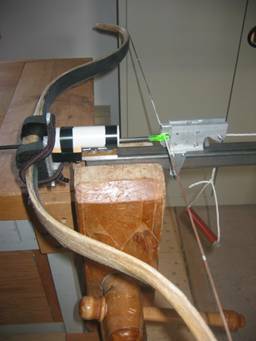 Bows rigidly mounted in a machine give higher velocity readings than hand held bows.12 Here, the bows were mounted with the help of rubber supports and tied on with rubber bands, simulating a more elastic hand grip. There was a considerable shock during testing with lighter arrows, which necessitated remounting before each shot. A chronometer (Archery Chrony, model F-1), equipped with factory lighting was used to measure velocity of the arrows. The bows were kept approximately 1 yard from the front window of the chronograph. At such close distance from the bows, effects of variation in the type, shape and fletching of arrows would not be manifested in the results. Bow weighing to establish the force-draw curves was done with a digital scale (Tri Coastal, model 264A). Again, the creep of materials could potentially skew the results, since longer holding would cause the readings to drop. To minimize this effect, the bows were quickly pulled to the desired length of draw, the reading taken within 1 second and the string returned to brace before the next reading. The readings were taken every 2 inches of draw to calculate the stored energy. Still, a reasonable estimate would be up to 2.5% error for efficiency figures. The ambient humidity can influence the results, as the natural materials absorb moisture. It was difficult to stabilize humidity during the tests, the range was between 35% and 55% relative humidity. The flight bows, in actual use, would be “conditioned” with heat to dry the bows before competitions. 6 Such treatment makes the materials stiffer per mass to boost arrow velocity. This was not done here, so the performance could still be improved. Experiments with conditioning will be carried out in the future. 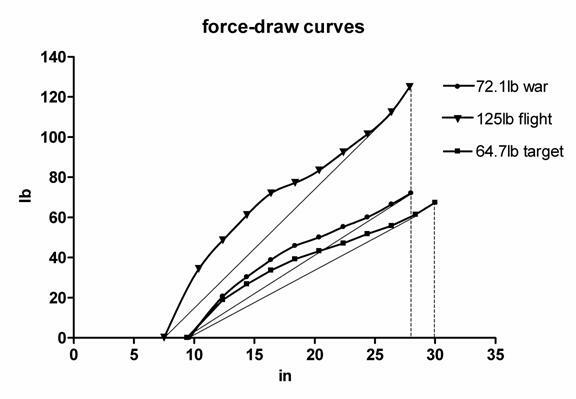 Force-draw curves for some of the tested bows are shown in fig 1. It is apparent the bows store considerable energy (the areas under the curves), even in the case of war and target bows braced higher than the flight bow (the brace heights were measured from the back of grip). The flight bow (44in long) stacks for the last 2 inches. The stacking is even more pronounced for the 41in and 42in bows (not shown). The last few inches of draw, however, would be accomplished with the siper. Drawing within the siper is best done with a sudden jerk (mefruk)6, so the stacking would help to limit the draw. Selfbows, including the longbow, have the force-draw lines straight or even concave, as the energy stored by these bows is lower. A useful coefficient (Ce) to compare stored energy of different bows is the ratio of the measured energy to the energy of a bow with the force-draw curve exactly straight at the same draw length and weight.13 In modern bows, a ratio of stored energy to the peak draw weight (SE/PDF) is another common indicator. The higher the Ce or SE/PDF, the more energy a bow is capable of storing. These two coefficients are listed in table 1 for each of the tested bows. The flight bows, even though extremely short, score quite well, helped by the lower brace. The war bows are normally braced higher due to their design, so the Ce and SE/PDF are relatively lower. The target and hybrid bows, also braced higher, are drawn to 30 inches which boosts the energy storage considerably. Good modern bows have the SE/PDF in the range of 0.85-0.96 for 28in draw and 0.92-1.04 for 30in draw.14 The efficiency, a ratio of arrow energy to the energy stored, is, however, a better indicator of bow performance, than the energy storage alone. A bow may not be efficient in transferring the stored energy to the arrow. The collected data of arrow velocity and efficiency at the corresponding arrow mass are shown in table 1. The results are indeed astonishing. Even the light weight 72lb bow can shoot a war arrow at 200 fps, while the more realistic 125lb+ bows are capable of around 250fps. With heavier arrows the efficiency is excellent at over 80%, while with the lightest arrows the bows can still maintain a reasonable efficiency around 50%. The arrow velocity of 357fps with 203 grain arrow for the 125lb flight bow gives a sense of what the flight bows were capable of. In a vacuum, this arrow would reach a distance of 1320 yards, or in air around 750 yards.15 Such distances, over 1000 gez, were indeed marked with menzil stones on the Okmeydan archery grounds in Istanbul.16 For the record distances of 930 yards, achieved by Tozkoparan Iskender and Bursali Shuja in the early 1500's,16 an arrow would have to be shot at close to 400fps.15 To reach this arrow velocity, the best flight bows (such as the tested 105.5lb) would be around 140lb@28in (with a light 150 grain arrow) or heavier. A longer than 28in draw to boost efficiency would allow the archer to use a lighter bow or a heavier arrow. It is difficult to directly compare bows of different draw weights, since the arrow velocity depends on the draw weight of bow. A useful factor, the ratio of arrow mass in grains to bow weight in pounds, can facilitate such comparisons. The fig.2 is a graph of grains/lb versus velocity for bows of different type and length (regression curves at R2 equal or better than 0.9997 were fitted to data points). Test results for a Crimean-Tatar bow1, were added here for comparison. It is apparent from the graph, the shorter 44in Turkish bow is not only as effective with heavy arrows as the longer bows, but also gives better performance with light arrows. This would be contrary to the common claim that only bows with heavy limbs are capable of good performance with heavy arrows. Light-limbed bows seem to have an advantage in a wide range of arrow weights. A limiting factor would be the length of limbs, since the short-limbed bows, below about 44in overall length, store less energy in the draw. The Crimean-Tatar bow, as a much longer bow at 60in, places at the lower end as expected, but does well with heavy arrows (Tatar arrows were considerably longer and heavier than Turkish). The curves for the Turkish bows diverge only below approximately 5grains/lb, corresponding to a 600 grain arrow for an average 120lb bow. It means most bows, regardless of length or type, would be equally effective with the heaviest, war-size arrows. The velocity for 600 grain arrows is 243fps on the average, for a realistic striking distance of 350 yards.15 Below this arrow mass the shorter bows would have an advantage. Bow masses are also listed in table 1. If compared with those of selfbows, it is apparent the limbs of Turkish composites are indeed rather light. It may be, the Turkish bows do not possess an "inherent" advantage over selfbows from the design point of view.17 It is inconceivable, however, that the selfbows could cast arrows at velocities as high as the Turkish bows.18 The efficiencies of bows tested here exceed selfbow performance, especially so with lighter arrows. The advantage lays in the short, reflexed limbs of low mass, aided by the superiour toughness and resiliency of horn and sinew. Other types of composite bows, longer than Turkish, are not likely to be as effective with light arrows as the bows tested here. It is tempting to compare the Turkish composites to fibreglass/carbon bows. Data for the best modern bows show arrow velocities between 180 and 200fps for 28in draw11,14 and between 190 and 210fps for 30in draw14, both at 9 grains/lb. The Turkish bows at the same 9 grains/lb give velocities between 185 and 205fps19, albeit with the Dacron strings. With Fast Flight strings the bows would have efficiencies even higher and arrow velocities correspondingly elevated. This places the Turkish bows at the level of performance equal to the best bows made of modern materials. It would be interesting to flight shoot a conditioned Turkish bow with a 60 grain carbon arrow used today. Distances achieved may approach the current records. 2. Hop-hornbeam (ironwood, Ostrya virginiana), hard maple (Acer saccharum) or Pacific yew (Taxus brevifolia). There is no significance in the choice of wood for the bows. From the author's experience the type of wood is far less important than the design characteristics of bows. 3. Mustafa Kani, Telhis Resail er-Rumat, Istanbul, 1847. Translated by J.Hein, "Bogenhandwerk und Bogensport bei den Osmanen", Der Islam, 1925, p. 353. 4. Unsal Ucel, Turk okculugu, Ataturk Kultur Merkezi Baskanligi, Ankara, 1998. This research was based on the Topkapi Palace collection. 5. Sal is the bending section of arm, between the grip (kabza) and the kasan section (sometimes called the ridged section or shoulder). The tip (bash) follows kasan. The angle between the kasan and tip is similar in most Turkish bows, the angle between the sal and kasan, as well as the recurvature of sal, varies. There was another type of bow (meshk), used for public displays, with the sal sections more recurved past the grip. 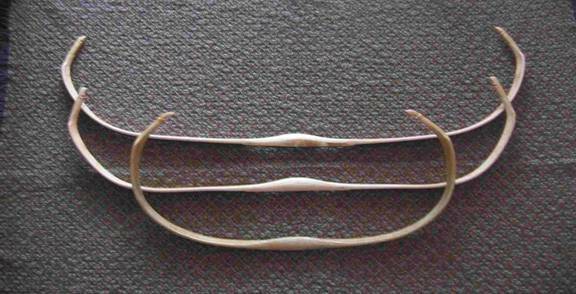 These bows (not tested) had the so called kabza kuram shape. The author is indebted to Ahmet Tekelioglu for help with translations. 9. Die Karlsruher Tuerkenbeute, Badisches Landesmuseum Karlsruhe, Hirmer Verlag, Muenchen, 1991. 10. F.Isles, “Turkish flight arrows”, Journal of the Society of Archer-Antiquaries vol 4, 1961. 15. T.L.Liston, Physical laws of archery, 6th ed. 1995, Liston Inc.
18. The best yew longbows can come close, but only with very heavy arrows and a longer draw to increase efficiency. A yew longbow, 120lb@32in shot a 1543 grain arrow (12.85 grains/lb) at 188fps (Pip Bickerstaffe, personal communication). The Turkish bows tested here were not drawn to such length, but by a rough approximation the velocity at 32in draw would be about the same, perhaps a little better for longer Turkish bows. Another 70lb longbow, however, (P.L.Pratt in R.Hardy, Longbow, a social and military history, Bois d'Arc Press, 1993) gave only 143fps at a similar 12.65 grains/lb. Still another 80lb longbow shot at around 162fps at 12.8gr/lb.1 For selfbows, drawn to 28in, the arrow velocity at 10grains/lb is no more than 175fps, normally much less, while the Turkish bows average 188fps at 28in draw. Note with lighter arrows the gap would widen considerably. 19. These velocities were scaled down to account for a slightly longer draw as compared to AMO-tested modern bows (Archery Manufacturers and Merchants Organization, now Archery Trade Association) . In the AMO standard, the grip thickness is always assumed to be 1 3/4in. The grips for Turkish bows were approximately 1 3/8in in thickness. It should be mentioned, only the very best few of the modern bows can show this kind of performance (most existing fibreglass replicas of hornbows are not included in this category).